Substrate Plain gravel or sand, can be attached to rocks or wood. 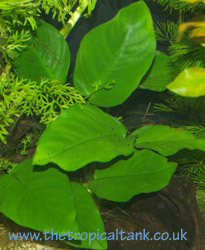 Comments This large variety of Anubias is a tough-leaved plant that can be grown onto rock or wood in the aquarium to form an impressive specimen plant. It will thrive in an aquarium with low light levels; in brightly lit aquaria it should be placed in a shady location to prevent algae forming on the leaves.